You've just enjoyed a big meal and are relaxing in front of the TV when it happens. A burning sensation begins to build in the upper abdomen, behind the breastbone, and makes your chest feel like it's on fire. The burning and pain may travel from your diaphragm all the way to your throat, and may be accompanied with a sour taste and the sensation of food re-entering your mouth. You're suffering from severe heartburn. Despite the name, heartburn has nothing to do with the heart. It's a digestive problem that occurs when stomach acid comes into contact with the lining of the esophagus, causing irritation. Most people suffer from heartburn occasionally, usually after a meal. How do you know when your condition is considered chronic? If you have heartburn once a month, it's considered mild. If you have heartburn once a week, it's moderate. It's when your heartburn occurs daily that it's considered to be severe. About 20% of all adults will have heartburn at least once a month. They can manage these uncomfortable episodes with a change in diet, over-the-counter antacids and weight lose. Even those who suffer from moderate heartburn can often find relief with these remedies. But for five to fifteen percent of adults, their heartburn is severe. For them, the above-mentioned remedies give only partial or temporary relief. When the lower esophageal sphincter (LES), the valve that keeps stomach acid in the stomach, is weakened or relaxed and doesn't do its job properly. This is the most common symptom of Gastroesophageal Reflux Disease (GERD). Certain foods, such as chocolate, fried and fatty foods, peppermint, coffee, alcohol, sugars, can weaken or relax the LES. Eating large meals or shortly before bedtime. Pressure on the stomach, including frequent bending over, tight clothes, lifting, obesity. Stress can increase acid production and slow down the emptying of the stomach. People who suffer from mild heartburn may consider it more of a nuisance than a condition that can cause any serious complications. But for those who suffer from chronic heartburn, episodes occurring from several times a week to several times a day, if it's left untreated can lead to severe complications. For people who suffer from Gastroesophageal Reflux Disease (GERD), heartburn can be chronic, and severe. This can cause scarring of the esophagus, which narrows the esophagus and makes it difficult to swallow. It can also lead to Barrett's esophagus, a condition where cells similar to those of the stomach lining develop in the lower esophagus. This severe damage to the esophagus increases your risk of developing cancer of the esophagus. You can find relief from your heartburn with a few self-care remedies. This involves making a few lifestyle and diet changes. Eat frequent smaller meals instead of three larger ones. This will help prevent excessive production of stomach acid. Eat slowly. One way to help you slow down while eating is to put your fork or spoon down between bites. Don't go to bed with a full stomach. Stay up at least three hours after eating your last meal or large snack before going to bed. This gives acid levels a chance to decrease before your body is in a position where heartburn is more likely to occur. Raise the head of your bed several inches. With your head elevated, it will help prevent reflux during the night. Avoid your heartburn triggers. Examples of foods and beverages that can trigger heartburn are coffee (including decaf), alcohol, fatty foods, caffeine-containing beverages and foods, onions, peppermint, chocolate, citrus fruits or juices, tomatoes. Stop smoking. Nicotine can weaken the lower esophageal sphincter, the muscle that controls the opening between the esophagus and stomach and prevents the acid-containing contents of the stomach from entering the esophagus. Wear looser-fitting clothes. Tight clothing squeezes the midsection and tends to push stomach contents upward. Lose weight. If you are overweight, losing weight can help relieve your symptoms. Chew gum. Chewing gum can provide short-term heartburn relief by stimulating the production of saliva, which dilutes and flushes out stomach acid. Drink warm liquids. Drinking a glass of lukewarm water or herbal tea after a meal can dilute and flush out stomach acid. Good question -- and the answer might not be what you expect. First, here are a few basic facts about heartburn, which has nothing to do with the heart. 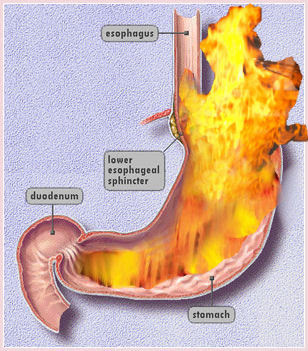 Heartburn happens when stomach acid refluxes, or seeps, through a valve called the lower esopahgeal sphincter and irritates the esophagus. Certain foods can trigger heartburn, but you may have a little more food freedom than you think, if you consider the pointers in this slideshow. The first thing to think about, in terms of curbing heartburn, isn't this or that specific food. It's the amount of food you eat at a time. When it comes to heartburn risk, the sheer volume of what you eat matters. And this is one case where bigger isn't better. 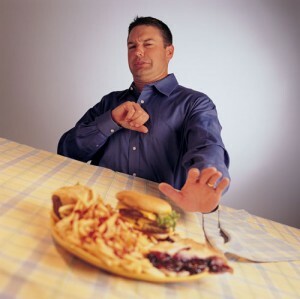 No matter what the food is, how good it looks, or how much you like it, eating too much food at once makes heartburn more likely. Tip: Try using smaller plates to trim your portions. Always eating in a hurry? Shoveling food down is also a no-no, if you want to tame heartburn. Leslie Bonci, MPH, RD, CSSD, director of sports nutrition at the University of Pittsburgh Medical Center, says the three G's -- grab, gulp, and go -- don't make for good digestion and can make GERD (gastroesophageal reflux disease) symptoms more likely. Heartburn is a GERD symptom. So slow down when you eat if you're concerned about heartburn symptoms. High-fat foods tend to stay in the stomach longer, and the longer they're there, the more likely discomfort can be, note Bonci and Elaine Magee, MPH, RD, author of Tell Me What to Eat If I Have Acid Reflux. And if you're eating big servings of those high-fat foods -- like a lot of fried chicken, chips, or wings -- then you've got a double whammy of two potential heartburn triggers -- too much food and fatty fare. You may not have to give up your favorite foods. Preparing them differently could help tame your heartburn. You might be able to bake, broil, grill, or roast some foods instead of frying them. And you could trim extra fat off meat and poultry, and cut the skin off chicken. Little tweaks might trim enough fat to make a difference for heartburn – and your overall health. Acidic foods -- which include tomatoes and products that contain tomatoes (such as tomato sauce and salsa) and citrus fruits (such as oranges, grapefruits, and lemons) -- can trigger heartburn, especially if you eat them by themselves, on an empty stomach. 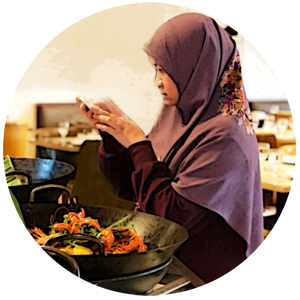 Vinegar is also highly acidic -- not that you're going to eat vinegar by itself, but it's a common ingredient in salad dressings and other dishes. You've got lots of other options for fresh produce besides tomatoes and citrus fruits. Try choosing some other fruits and vegetables. If you do want to have acidic foods, limit the portion size and have something else -- that isn't acidic -- with it. For instance, have a little less tomato sauce and have it with spaghetti and a little meat or vegetables at the same time. Everyone is different, so experiment to find your comfort zone. Preventing heartburn isn't just about food choices. Certain drinks can make heartburn more likely, inlcluding coffee (regular or decaffeinated), caffeinated tea, colas, carbonated drinks, and excess alcoholic beverages. Caffeinated beverages boost acid in the stomach and alcoholic beverages can relax the lower esophageal sphincter, leading to heartburn. And sodas, regardless of caffeine, can bloat the stomach, which may lead to heartburn. To make heartburn less likely, choose drinks that aren't fizzy and don't contain caffeine. Options include herbal teas, milk, and plain water. Having water with meals would also dilute stomach acid, making heartburn less likely. You may also want to limit tomato or citrus juices because of their acidity. And if you must have your coffee or other drinks that could promote heartburn, try to cut back -- maybe a smaller mug would help. Chocolate contains caffeine, and caffeine can be a heartburn trigger. But if you can't bear the thought of giving up chocolate, see if cutting back helps you avoid heartburn. Watch your portion size, too; maybe you can handle a nibble. And keep the big picture in mind -- is that chocolate coming at the end of a fatty feast? Are you eating it by itself on an empty stomach? In short, what other heartburn triggers may be at play? Got a taste for spicy foods -- the hotter, the better? All that heat may provoke heartburn. Peppery foods and hot sauces can be heartburn triggers. But it's not just scorching hot items that are in question. Peppermint is cool, not fiery, but it may relax the lower esophageal sphincter, leading to heartburn. And although garlic and onions aren't spices, they are flavorful foods that may spur heartburn. Just because you have heartburn, you aren't necessarily headed for a lifetime of bland foods. Try turning down the heat. You don't have to drown your wings in hot sauce, for instance. And maybe you could dial your chili down to two alarms instead of four. Easing up a bit on the spiciness could make a difference. "There are other ways to flavor foods that don't really require something that burns one's tongue," says Bonci. Everyone's different. Your heartburn triggers might be different from someone else's. For instance, you might tolerate spicy foods better than someone else with heartburn, and you might find you can handle a small cup of coffee as long as you don't gulp it down by itself. You'll want to learn what you can handle and what leads to heartburn, and jotting that down can help you pinpoint what eating habits you need to change. Magee suggests chewing gum after a meal to stimulate saliva production, since saliva neutralizes acid and spurs the stomach to move its contents into the small intestine faster -- basically, moving it down the line before heartburn sets in. Magee recommends picking a flavor that isn't peppermint or mint, in order to avoid relaxing the lower esophageal sphincter. Want more ways to curb heartburn? Don't lie down right after a meal -- allow three hours between dinner and bedtime. Since smoking and being overweight may also make heartburn more likely, take steps toward a healthier lifestyle, if warranted. And although occasional heartburn is common, you may want to ask your doctor about frequent heartburn, which could be a symptom of GERD. More about heartburn here. GERD? Here.